As a Linux System Admin, It’s alwasy an obligation to install sofware packages on a server.However, it’s not always compulsary to install packages from official CentOS repositories over the internet.A good example is when you have slow internet connection and would like to save bandwidth by creating a repository on LAN. 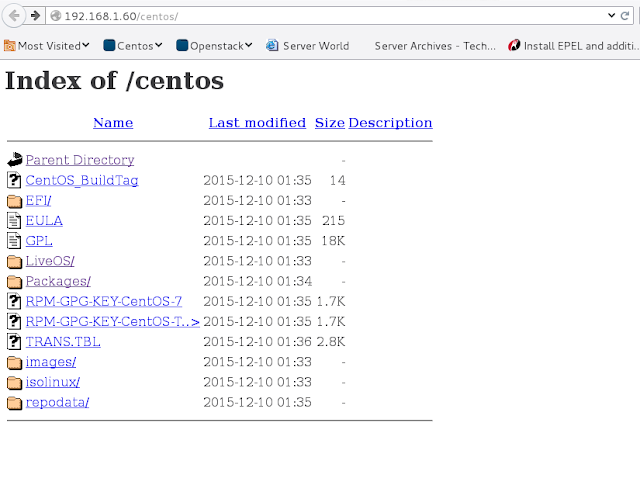 Step 1: Downloading CentOS-7-x86_64-Everything ISO or CentOS 7 DVD ISO image. I’ll be using CentOS-7-x86_64-Everything ISO image which can be downloaded from download page in Official CentOS 7.You can also use CentOS 7 DVD ISO. Step 2: Create Mount points and Mount ISO image. c) Confirm it’s mounted using du or ls command. Mounting the ISO image file to a web server directory. I’m using Apache server running on another CentOS server.If you’re doing this on any other Linux server, replace the root directory of web server with the one provided here. Step 3: Create a repo and put it inside /etc/yum/repos.d/ directory. This is done on Server with CentOS minimal installed, or server that you need to install packages on while pulling the packages from local reposotory you just added. b) For Step 2 part 2: : The IP address of the server I’m using is 192.168.1.60. Below is the repo configuration. c) For Step 2 part 3: The mount point we used was /mnt/centos/cdrom/. NOTE: Enabling the repository locally added alone is not necessary enough to let us install software packages from it.This is because by default, any package being installed will use CentOS Base repository.We’ll discuss on a working solution to this shortly. 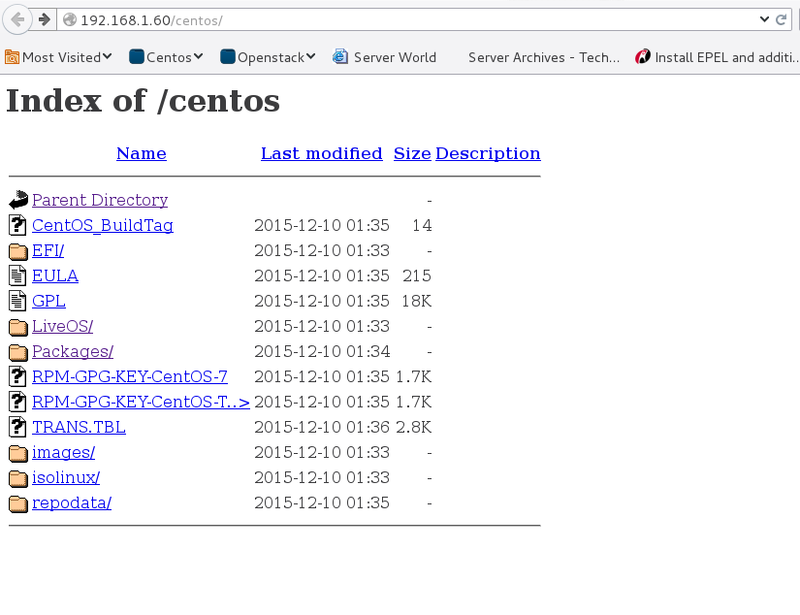 NOTE: When other CentOS repos are enabled and you specify centos-local repo, yum will always try to download latest package from repo with the latest package.The default repo being CentOS Base repo. If you want to force yum to use local repository, you have to disable all other repos and enable them once you are done.You have two options you can use to achieve this. 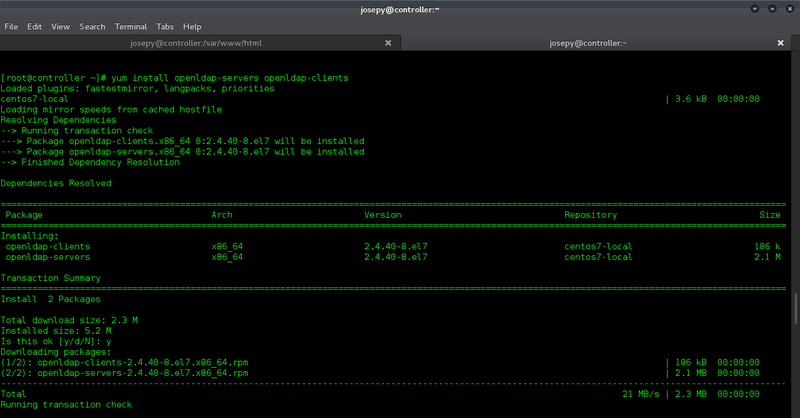 As you you can see from below screenshot, the repository used is centos7-local. [[email protected] ~]# yum groupinstall "GNOME Desktop"
[[email protected] ~]# yum --disablerepo=* --enablerepo=centos7-local groupinstall "Virtualization Host"
If you had CentOS 7 Minimal version and installed GNOME Desktop Environment Group packages, don’t forget to tell systemd to boot to GNOME Desktop Automatically. That’s all. Remember to copy repositories back from ~/repos/ to /etc/yum.repos.d/ directory. Next articleOpenstack Liberty NoFloatingIpInterface: Interface eno16777736 Not Found.